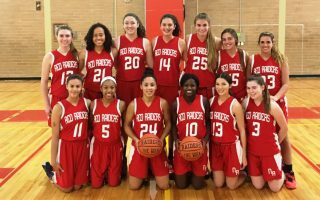 No one, least of all veteran Coach Kevin Metcalf and his staff, would deny that this season has already gone better than expected for the North Rockland High School girls basketball team. Perhaps the success has been improbable, especially considering the graduation of Division 1 player Gaby Cajou to Manhattan College. Then again, the success was not an impossible task either, even with a lineup featuring one senior starter (team captain Naja Rivera of Pomona) and eight teammates who are coming back in 2018 (including injured sophomore D’Chae Dunn of Haverstraw, who is serving as team manager while recuperating from a torn ACL). This far brings them to the Westchester County Center in White Plains tonight, with the seventh-seeded Red Raiders going against another giant and county rival Albertus Magnus, the No. 3 seed. The Lady Falcons breezed into the Section 1 Class AA semifinals with a 60-46 victory over Ketcham behind 16 points from Tess Lorenz and 14 from Kate Mager. Meanwhile the Red Raiders merely stunned No. 2 seed Ursuline, 69-59, in New Rochelle to earn a rematch with the Lady Falcons, who beat North Rockland rather handily on Dec. 26, also at the County Center, during the Slam Dunk Challenge. Going into the AA quarterfinals, Ursuline, ranked seventh in the state, was the apparent choice — marred only by a loss to a Baldwin team from Long Island and coming off an overtime loss to powerhouse Ossining. The Red Raiders, who are 15-7 and notched their third straight league championship with a third straight unbeaten mark (8-0), shocked Ursuline as junior guard Lexi Huertas of Garnerville scored 17 points with six assists, sophomore 6-foot-3 center Trinity Bosecker of Stony Point poured in 14 points and senior shooting guard Danielle Cajou, who is Oneonta-bound, harvested 15 off the bench. The Red Raiders also showed their mettle in a fund-raising tournament during the holiday break in upstate Elmira, placing second in an eight-team field over four days. Two other cogs, who came to the team virtually out of nowhere, are soccer standouts Brianna Williams of Tomkins Cove, who earned a scholarship to Central Connecticut State University for her play on the pitch, and goalie Jenna Braunagel. Metcalf’s assistants are Hall of Fame-bound Chris Roth of Stony Point, who teaches art at the school, and one-time Clarkstown North HS player Steve McCready of Tomkins Cove, an O&R employee who volunteers in his spare time. Interestingly, Metcalf was Roth’s JV coach for 21 years during Roth’s 29 years as the boys coach, and Pat Buckley, the Albertus Magnus coach, was mentored by Metcalf and Roth in the early ’90s when Buckley was playing basketball at summer camp in Stony Point. In another game today at the County Center, Tappan Zee challenges No. 2 Somers in a Class A semifinal. 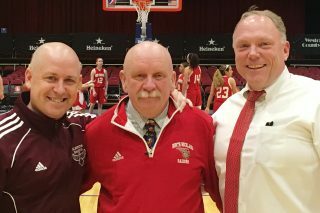 The survivor of the Albertus Magnus-North Rockland showdown will vie for the title at the County Center at 2 p.m. on Sunday, against the winner of No. 1 Ossining versus No. 4 Our Lady of Lourdes. MOUNTIES ICED: Two powerhouse programs with outstanding histories – Suffern and Mamaroneck — went head-to-head for hockey supremacy in the Section 1 Division 1 hockey semifinals at Brewster Ice Arena. The Tigers of Coach Mike Chiapparelli took the measure of the Mounties, 4-0, earning a trip to the state tournament in Buffalo. The Mounties, under veteran Coach Rob Schelling, lost to Mamaroneck three times this season, but the Tigers were, after all, the defending state champion. Mamaroneck jumped to a 3-0 lead in the first period, an almost untenable position. “That made it tough,” Schelling was quoted in The Journal News. “We did it earlier against Scarsdale, but it’s not easy when you’re playing a team with this kind of talent.” Goaltender Ryan Fueg made 20 saves in the loss. The Mounties had advanced to the final with a 5-3 win over Mahopac as team captain David Rozitis scored two goals. Kyle Forester and Hunter Churgin opened an early two-goal lead for Suffern, which also received a goal from Evan Cama. Mamaroneck had advanced by beating visiting North Rockland, 3-1, at Hommocks Ice Rink. Bryan Jensen had the Red Raiders’ goal. SCHOLASTIC SHORTS: Two members of the wrestling team at Pearl River HS fought back from losses in the quarterfinals to earn third-place finishes at the state wrestling championships at the Times Union Center in Albany. Sophomore Jack Chesman showed true grit at 145 pounds, as did senior Anthony Malfitano at 170. … The combined Nyack/Tappan Zee boys lacrosse team is slated to open the season on March 26, meeting Long Island’s Sachem North at Manhattan College in Riverdale. 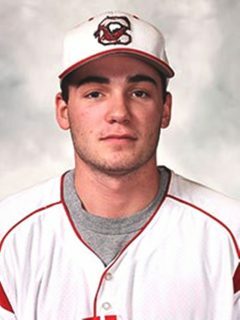 COLLEGIATE CLIPS: North Rockland HS graduate Eric Sandusky of Stony Point, a left-hander, is a freshman on the pitching staff at SUNY Cortland. The Red Dragons will be in Baltimore, Md., this weekend for a doubleheader on March 4 and a single game on March 5 against Scranton at 11 a.m. The doubleheader Saturday features Johns Hopkins at 11 a.m. and Frostburg State at 2:30 p.m. … Midfielder Kevin McNally of Hillburn had four points as the Mercy College men’s lacrosse team fell to No. 6 Seton Hall University, 14-19, in Greensburg, Pa. McNally is third in scoring with 13 points for the Mavericks (3-1), who are home on Saturday to host Saint Anselm at 1 p.m. and stay at home on March 11 to entertain Le Moyne, also at 1 p.m. … Alex Ferrante of Nyack is a senior member on the golf team at Fairfield University. The Stags travel to North Myrtle Beach, S.C., March 13-14 to compete at the Bash at the Beach at The Surf Golf and Beach Club. … Cortland sophomore wrestler Matt Caputo of Stony Point, an alum of North Rockland HS, ended his season at 22-15 the NCAA Division II Northeast Regional Championships in Bristol, R.I. Caputo, competing at 149 pounds, opened with a 6-4 setback in the first sudden-victory period. He rebounded with a 9-4 decision against Yo Akiyama of Williams in the consolation bracket, but was eliminated in the next round. … Junior Wakeema Cabey of Spring Valley is a sprints specialist on the women’s track and field team at Nyack College. The Warriors get under way on March 25 at the St. Joseph’s Spring Opener in Patchogue. THIS & THAT: The 44th Rockland County Sports Hall of Fame induction dinner is set for Saturday night, April 22 at the Pearl River Elks Club in Nanuet. The inductees are Coach John Castellano, Nyack; Phil Donnelly, Pearl River; Tom Mulroy, Ramapo; Al Taylor, Nyack; Jerome Whidbee, Nyack; and Fred Adler, recipient of the Joseph Holland Lifetime Achievement Award. For information contact Pete Castellano at 201-390-3245 or riverviewmall@aol.com or visit www.rcshf.org. … The Rockland Rowing Association (RRA) has scheduled its 11th Pull with Purpose Row-A-thon for Saturday, March 18 from 8:30 a.m.-11:30 a.m. at the Adler Community Room on the 4th floor near the skating rink at the Palisades Center Mall in West Nyack. Details can be found at www.rocklandrowing.org. … Maccabi USA is seeking qualified Jewish male wrestlers, ages 18-35, to represent Team USA at the 20th World Maccabiah Games in Israel, July 4-18. The USA Team is expected to feature more than 1,100 members at the Games, competing against 10,000 athletes from 80 countries, participating in 43 sports. The Maccabi USA Team Trials will be held April 2 in Philadelphia, Pa. Interested Open Wrestlers must apply for the games prior to the trials. Please visit www.maccabiusa.com to complete an application. For more information, contact Chris Feder at hitthegym@earthlink.net or call 415-585-0663.